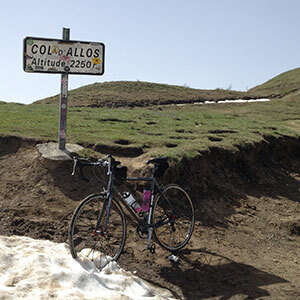 It’s a wonderful, exhilarating, rewarding and very satisfying experience to reach the summit of any Col (mountain pass) in the Alpes on a bike. It’s even sweeter when you can do it from both sides, back to back, on the same day. It is such a great feeling to get to the top of climb and see other cyclists celebrating that they’ve made it to the summit, all the time knowing that you’ve been here not once, but twice in a row. Rain! Wind! Thunder! Lightning! Cold!